Last week at the SoPD, we received an interesting email from reader Gabriel “from Tiana (near Barcelona) (Spain)”. The email brought our attention to an interesting new article that was published in a recent issue of the Journal of Neuroscience. The research report involves prolyl oligopeptidase (PREP) inhibitors and some pre-clinical data involving a model of Parkinson’s disease. In today’s post we will review the article and what we know about PREP-inhibitors. What is prolil oligoopep..tid… whatever? It’s really very simple. Prolyl oligopeptidase is a serine protease, that cleaves short peptides containing proline-residue. Prolyl oligopeptidase (or PREP) is an enzyme that is involved in the making and destruction of certain types of hormones and neuropeptides (Neuropeptides are a group of small molecules used by brain cells to communicate with each other). PREP is required for cutting certain bonds on some of these small molecules, allowing them to function normally or be broken down and recycled. PREP can be found in cells from most of species – from bacteria to human – suggesting that it has important functions across evolution. In addition, PREP has been associated with amnesia, depression and blood pressure control. What is has PREP got to do with Parkinson’s disease? Interestingly, PREP activity changes during the ageing process. It also changes during neurodegenerative conditions, such as Alzheimer’s and Parkinson’s diseases. Given this situation, several PREP inhibitors were developed during the 1990s, and they were found to have a positive effect on memory and learning in animal models of Alzheimer’s disease (Click here for more on this). So what is known about PREP in Parkinson’s disease? Title: Post-proline cleaving enzyme in human cerebrospinal fluid from control patients and parkinsonian patients. Authors: Hagihara M, Nagatsu T.
Journal: Biochem Med Metab Biol. 1987 Dec;38(3):387-91. When the researchers compared normal healthy subjects with people who have Parkinson’s disease, they found that people with Parkinson’s disease exhibited a marked decrease in the activity of PREP in the cerebrospinal fluid. Interestingly, this decrease was not evident in the blood, suggesting that something was happening in the brain. Title: Prolyl oligopeptidase colocalizes with α-synuclein, β-amyloid, tau protein and astroglia in the post-mortem brain samples with Parkinson’s and Alzheimer’s diseases. Authors: Hannula MJ, Myöhänen TT, Tenorio-Laranga J, Männistö PT, Garcia-Horsman JA. Journal: Neuroscience. 2013 Jul 9;242:140-50. The researchers in this study were investigating where PREP was actually located in the postmortem brain. In people with Parkinson’s disease, they found that a very strong presence of PREP in the substantia nigra (the region which loses dopamine neurons in this condition). Interestingly, they also noted that PREP was co-localized with the Parkinson’s associated protein alpha synuclein (meaning where they found PREP, they also saw alpha synuclein). It is also interesting to note that they did not see this pattern in the brains of normal healthy controls or people with Alzheimer’s disease. Title: Prolyl oligopeptidase stimulates the aggregation of alpha-synuclein. Authors: Brandt I, Gérard M, Sergeant K, Devreese B, Baekelandt V, Augustyns K, Scharpé S, Engelborghs Y, Lambeir AM. Since alpha synuclein and PREP were in the same locations in the Parkinsonian brain, the researchers in this paper were interested to see if the two protein actually functioned together and required each other to do their respective jobs. What they found, however, when they put the proteins together in cell culture was a surprise: an acceleration in the accumulation (or aggregation) of alpha synuclein. Aggregation of alpha synuclein is a key feature of the Parkinsonian brain. 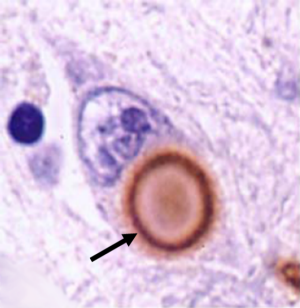 It is believed to be responsible for the presence of Lewy bodies (the dense circular clusters in cells in the brains of people with Parkinson’s disease) and may be involved in the cell death associated with the condition. With the discovery that PREP is involved with the aggregation of alpha synuclein, the researchers suddenly had a new disease-related target to investigate further. And this is what the new Journal of Neuroscience paper has been explored. So what was published in the recent Journal of Neuroscience report? Title: Inhibition of Prolyl Oligopeptidase Restores Spontaneous Motor Behavior in the α-Synuclein Virus Vector-Based Parkinson’s Disease Mouse Model by Decreasing α-Synuclein Oligomeric Species in Mouse Brain. Authors: Svarcbahs R, Julku UH, Myöhänen TT. Journal: J Neurosci. 2016 Dec 7;36(49):12485-12497. Previously Timo and co. have demonstrated that PREP inhibitors can reduce the levels of alpha synuclein in a genetically engineered mouse that produces very higher levels of alpha synuclein (click here to read that report). In the current study, they modelled Parkinson’s disease in mice using viruses that cause the production of high levels of alpha synuclein in the dopamine neurons (that are affected by Parkinson’s disease). This over-production of alpha synuclein causes problems for the dopamine neurons and some of those cells die off, in effect modelling what is happening in the brains of people with Parkinson’s disease. Using a PREP inhibitor (KYP-2047, which is crosses the blood–brain barrier), the researchers were able to rescue the behavioural impairment caused by the viral over-production of alpha synuclein. In addition, the administration of the PREP inhibitor reduced the levels of certain types of alpha synuclein in the brain. The researchers also saw a mild neuroprotective effect with less dopamine neurons dying (perhaps if the study had continued for longer they might have seen a larger difference) and less dopamine dysfunction in the animals that received the PREP inhibitor, suggesting that treatment with the PREP inhibitor protected the dopamine neurons and restored their normal functions. The critical aspect of this study was that the PREP inhibitor treatment was only given to the animals after the behavioural problems started, and it was still able to provide positive benefits to them. The researchers concluded that these results suggest that PREP inhibitors should be further investigated for Parkinson’s disease. We desperately need some new and novel targets to help attack this disease, and PREP inhibitors represent a completely new approach. Yes, they are going after alpha synuclein (and the jury is still out as to whether alpha synuclein is a causal agent in the disease), but they are certainly taking a different route. While the alpha synuclein vaccines and antibodies currently being tested in clinic trials are removing free floating alpha synuclein, PREP inhibitors are stopping alpha synclein from actually aggregating. This is exactly the kind of new approach we are looking for. Whether PREP inhibitors reducing alpha synuclein aggregation is functionally a good thing for Parkinson’s disease requires further testing. For example, if alpha synuclein is playing an antimicrobial function by aggregating around bacteria/viruses, inhibiting that aggregation might not be a good thing – it might leave us more vulnerable to illness. But the good news here is that PREP inhibitors represent a new direction for us to explore in the treatment of Parkinson’s disease, and if blocking alpha synuclein aggregation does slow/halt the disease then PREP will definitely be worthy of further investigation. EDITORIAL NOTE: Full disclosure here, the author of this blog is neither collaborating nor familiar with Dr Timo Myohanen. We just think his research is pretty cool and look forward to seeing where this line of investigation will ultimately lead. And yes, we’re writing nice things about him in the hope that he won’t mind us borrowing some of the schematics and images from his lab website to better explain what PREP is. In this blog I noticed that in the failed past studies particularly the Tocopherol study it mentioned the positive effects of Deprenyl. Has there been any follow up studies of this positive finding. It sounds like a half failed study to me. I have only recently been diagnosed and have not seen anything about Deprenyl. Deprenyl (also known as Selegiline) is a selective irreversible MAO-B inhibitor. MAO-B is an enzyme in dopamine neurons. It’s function is to break down excess dopamine in neurons after it has been reabsorbed. By inhibiting MAO-B, there is more dopamine floating around. Deprenyl is sometimes used as a first line treatment, as it can delay the necessity of L-dopa treatment by about 6 months. And often the two treatments (deprenyl and L-dopa) are then used in combination, allowing for a lower dose of L-dopa and reducing the risk of motor complications of long-term L-dopa treatment. The DATATOP study may be the trial you are referring to ( https://www.ncbi.nlm.nih.gov/pubmed/8417384 ). It was the first double-blind placebo-controlled neuroprotection trial for deprenyl. It enrolled 800 people with newly diagnosed PD and randomized them to receive either deprenyl, tocopherol, or a placebo. After 12 months, approx. 45% of the placebo treated group started using levodopa compared with just 26% in the selegiline group. Whether this delay supports a disease-modifying label is the subject of much debate. Two other trials found similar results ( https://www.ncbi.nlm.nih.gov/pubmed/8302306 and https://www.ncbi.nlm.nih.gov/pubmed/1736162 ). I am unaware of any follow up trials demonstrating anything different (& I am happy to be corrected on this). The FDA’s requirement for proving disease modification are pretty rigorous, and they have refused to label Deprenyl as such. In animal models of PD, there have been signs of neuroprotection, but those results have not translated meaningful into humans so it is difficult to say. Demonstrating neuroprotection in humans is difficult as it requires a study design that allows differentiation between improvements that result from symptomatic benefit and those that actually alter the course of the disease (Pramipexole has had similar issues demonstrating this – https://www.ncbi.nlm.nih.gov/pubmed/23726851).